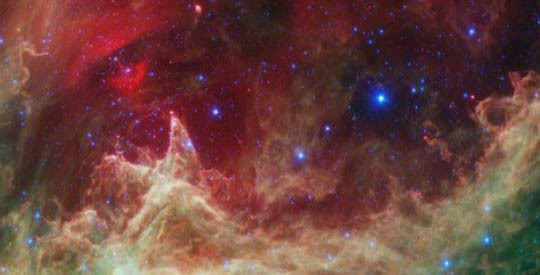 W5 Star Formation Region. Image credit: NASA / JPL / CfA. Might there be more than one universe? If so, we need to rethink our notions of the cosmos. Twenty years later, in 2009, I sat with a few dozen other scientists in a room at the Kavli Institute for Cosmology at the University of Cambridge to watch the launch of the Planck satellite. A muffled buzz filled the room with cautious excitement. Casual conversation would be interrupted by concern over pauses in the live transmission. When the countdown began, the room fell eerily quiet, and with lift-off came deep cheers and loud applause. Four years into its mission, the Planck collaboration released the most finely detailed map of the CMB ever measured. In its details was a bombshell: anomalies in the distribution of the CMB brightness that could not be the result of anything in our own universe. Here was an empirically observed hidden code pointing to a rich and vast cosmos, in which our own universe is but one humble member. The limits of our range of exploration had suddenly grown immensely. We were at the shore of the multiverse. Contemplating the existence of other universes is not a new endeavour. From prehistoric times to the present day, this possibility has sparked the imagination of philosophers, writers, and scientists. But for most of history, it was not an idea that was taken seriously. Philosophically, it was an unnecessary complication, one that simply pushed the mystery of our origins to a new layer of reality that was unobservable in principle. And, since a theory needs to be falsifiable in order to be scientific, many scientists did not see the multiverse as “real” science. Aesthetically, too, the multiverse was not attractive. Scientists believed nature to be simple and economical. One universe was plenty, so why bother with more? This is an edited version of an article that originally appeared on Nautilus. Written by Laura Mersini-Houghton – Professor of Physics at the University of North Carolina.